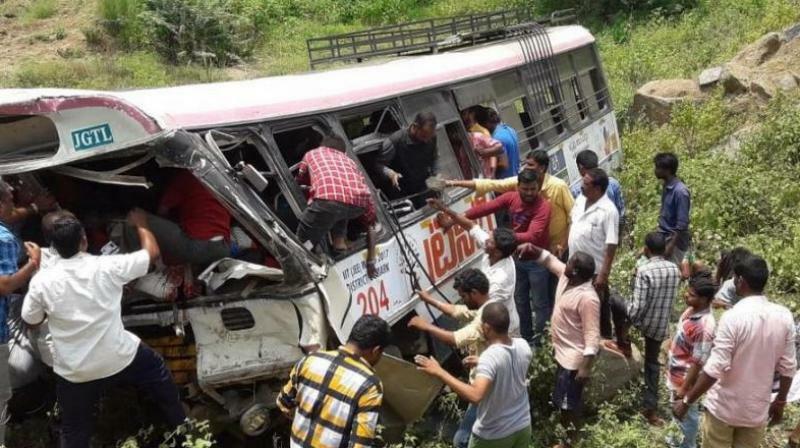 Hyderabad: The driver of the bus that plunged into a ravine in Telangana killing 57 people was conferred the best driver award by government only last month, officials said Wednesday even as the death toll from the accident rose to 60 with three women succumbing to injuries. The overcrowded state-run bus had swerved off the road and hurtled down a hillside into a gorge Tuesday, killing 60 people and injuring 28 others in one of the worst highway tragedies in recent memory. The accident involving the Telangana State Road Transport Corporation (TSRTC) bus occurred on the ghat section of the road near Shanivarapet village some 200 km from state capital Hyderabad. The TSRTC has submitted a preliminary report to the government indicating that the accident happened when the driver, who was also killed, either lost control while trying to avoid a collision with an oncoming vehicle or negotiating a sharp downhill curve, a corporation official said. Three injured women died undergoing treatment Wednesday, police said. Around 30 others injured are undergoing treatment in different hospitals, an Investigating official said adding the condition of at least three others remains critical. The deceased include 40 women including a pregnant woman, whose delivery was scheduled for Wednesday, the official said. Three children are among the deceased, he said. All the bodies were identified and handed over to the families after post-mortem and inquest, Jagtial Deputy Superintendent of Police Venkat Ramana told PTI. Some of the victims were pilgrims returning to Jagtial from the temple town of Kondagattu after offering prayers at the famous Hanuman temple. The deceased were from nearby villages and most were daily commuters, he said. Some of them died due to suffocation, while others succumbed to head injuries. A case has been registered and investigation is on, Ramana said. He said experts will examine the vehicle to ascertain the exact cause of the accident. The bus depot manager was suspended Tuesday, a TSRTC official said, adding the vehicle was still in the gorge. He dismissed media reports that the driver had taken the dodgy shortcut to save fuel, insisting "it is the regular route, and the driver was also regular". The official said bus driver Srinivas was not only presented the best driver award last month, but was also earlier rewarded for best fuel efficiency, which indicated his impeccable driving skills. The officer, who did not want to be named, ruled out the possibility of brake failure being the cause of accident. "Based on prima-facie information, a preliminary report has been submitted to the government. A detailed report will follow after a thorough inquiry," he said. Police and TSRTC officials said around 90 passengers were on the bus against seating capacity of 54 when it met with accident. Scientists identity anti-microbial protein in milk. TRS leaders themselves feel that the state government has reacted rather late, allowing opposition parties to get the upper hand. The post-graduate students state that the bond is being demanded against the rules. A. Mitha, 19, killed herself by hanging because she became depressed over the results. Three babies including a month-old girl were rescued from the buyers, police said. The three levels are at the spot evaluation centres, according to senior officials of the education department. KCR orders free recounting of answer sheets of 3.28 lakh students who failed. Stung, the corporation to reduce human role. 82 mega heavy duty motors installed at Kaleshwaram. The office of the state election commission took cognizance of the letter and has issued a notice. Mahindras electric vehicles on the Uber platform would include the e2oPlus hatchback and the eVerito sedan. Telangana Rashtra Samiti announced the name of Kova Laxmi as the chairperson candidate for Asifabad district. The eTelangana is not responsible for the content of external sites.